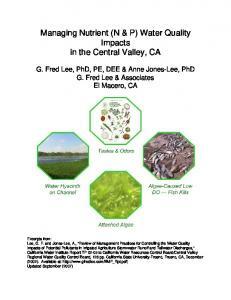 Reference as Lee, G. F., and Jones-Lee, A., “Role of Aquatic Plant Nutrients in Causing Sediment Oxygen Demand Part II – Sediment Oxygen Demand,” Report of G. Fred Lee & Associates, El Macero, CA, June (2007). After Jones and Lee (1982, 1986). 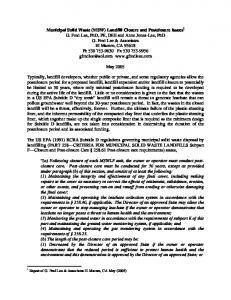 and Water Environment Federation), American Public Health Association, Washington, D. C., (latest edition). 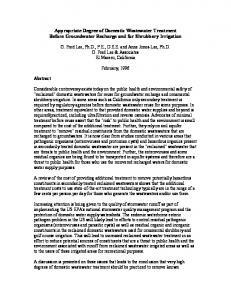 Baird, R, B., and Smith, Roy-Keith, “Third Century of Biochemical Oxygen Demand,” Water Environment Foundation, Alexandria, VA (2002). Bortleson, G. C., and Lee, G. F., "Recent Sedimentary History of Lake Mendota, Wisconsin," Environ. Sci. & Technol. 6:799-808 (1972). http://www.members.aol.com/LFandWQ/BortlesonSedHistMendota.pdf Bowie, G. L., Mills, W. B., Porcella, D. B., Campbell, C. L., Pagenkopf, J. R., Rupp, G. L., Johnson, K. M., Chan, P. W., and Gherini, S. A., “Rates, Constants, and Kinetic Formulations in Surface Water Modeling,” 2nd edition, US EPA EPA/600/3-85/040, US EPA, Athens, GA, June (1985). 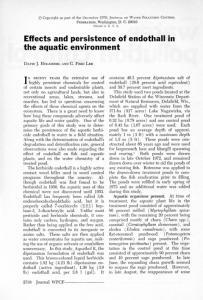 Bowman, G. T., and Delfino, J. J., " Sediment Oxygen Demand Techniques: “A Review and Comparison of Laboratory and in Situ Systems," Water Research 14:491-499 (1980). 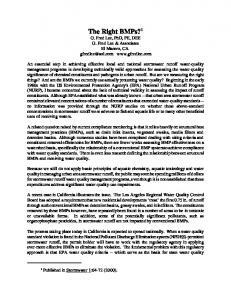 Chapra, S., Surface Water Quality Modeling, McGraw-Hill, New York (1997). Conway, C., Oxygen Depletion in the Hypolimnion, MS thesis Water Chemistry Program, University of Wisconsin Madison, Madison, WI (1973) Delfino, J., “Aqueous Environmental Chemistry of Manganese,” PhD dissertation, Water Chemistry Program, University of Wisconsin Madison, Madison, WI (1968). 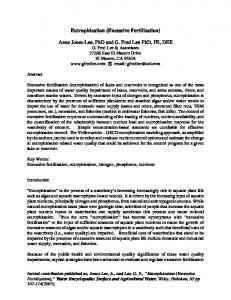 Delfino, J., and Lee, G. F., "Chemistry of Manganese in Lake Mendota, Wisconsin," Environ. Sci. & Technol. 2(12):1094-1100 (1968). http://www.members.aol.com/LFandWQ/DelfinoChemistryMn.pdf Delfino, J., and Lee, G. F., "Variation of Manganese, Dissolved Oxygen and Related Chemical Parameters in the Bottom Waters of Lake Mendota, Wisconsin," Journ. Water Res. 5:1207-1217 (1971). http://www.members.aol.com/LFandWQ/DelfinoVariationMendota.pdf Delfino, J. J., Bortleson, G.C. and Lee, G. F., “Distribution of Mn, Fe, P, Mg, K, Na and Ca in the Surface Sediments of Lake Mendota,” Environ. Sci & Technol. 3:1189-1192 (1969). 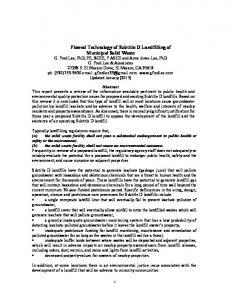 http://www.members.aol.com/LFandWQ/DelfinoDistributionMn.pdf DWR, “Sacramento San Joaquin Delta Overview,” California Department of Water Resources, Sacramento, CA (2007). 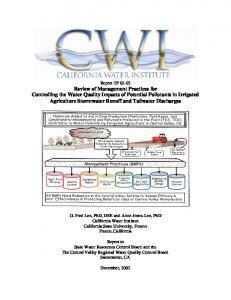 Available at http://baydeltaoffice.water.ca.gov/sdb/tbp/deltaoverview/index.cfm Fitzgerald, G. P., “The Effect of Algae on BOD Measurements,” J. Wat. Pollut. Control Fed. 36:1524 (1964). 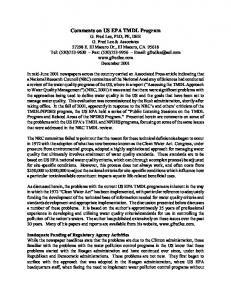 Committee and CALFED Bay-Delta Program, G. Fred Lee & Associates, El Macero, CA, March (2003). 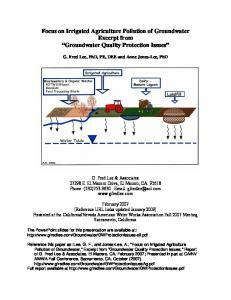 http://www.gfredlee.com/SynthesisRpt3-21-03.pdf Lee, G. F., and Jones-Lee, A., “San Joaquin River Deep Water Ship Channel Low DO Problem and Its Control,” PowerPoint slides presented at SETAC World Congress Portland, OR, November 2004. Updated December (2004a). 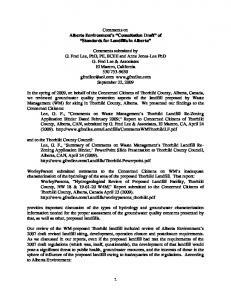 http://www.members.aol.com/GFLEnviroQual/LowDOSummaryDec2004.pdf Lee, G. F., and Jones-Lee, A., “Supplement to Synthesis Report on the Low-DO Problem in the SJR DWSC,” Report of G. Fred Lee & Associates, El Macero, CA, June (2004b). http://www.members.aol.com/duklee2307/SynthRptSupp.pdf Lee, G. F., Rast, W., and Jones, R. A., "Eutrophication of Water Bodies: Insights for an Age-Old Problem," Environ. Sci. & Technol. 12:900-908 (1978). 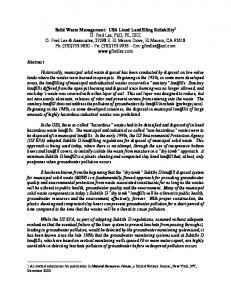 http://www.members.aol.com/apple27298/Eutrophication-EST.pdf Lee, G. F., Jones-Lee, A., and Burr, K., “Results of the August 5, 2003, Tour of the South Delta Channels,” Report of G. Fred Lee & Associates, El Macero, CA (2004). 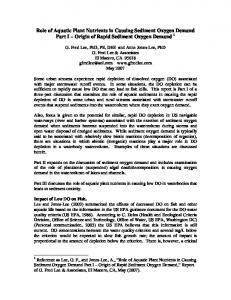 http://www.members.aol.com/duklee2307/South-Delta-Tour.pdf Litton, G. M., “Sediment Oxygen Demand, Sediment Deposition Rates and Biochemical Oxygen Demand Kinetics in the San Joaquin River near Stockton, California, Fall 1999 (Final),” Report prepared for City of Stockton and San Joaquin River Dissolved Oxygen TMDL Technical Committee, June 25 (2003). http://www.sjrdotmdl.org/library_folder/litton_final_report.pdf Morgan, J, J., and Stumm, W., “The Role of Multivalent Metal Oxides in Limnological Transformations as Exemplified by Iron and Manganese,” Proc. 2nd Int. Conference on Water Pollution Research, pp. 103-131, Pergamon Press, New York (1965). 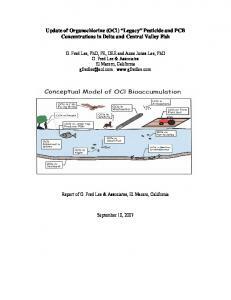 Rast, W. and G. F. Lee, “Summary Analysis of the North American (US Portion) OECD Eutrophication Project: Nutrient Loading-Lake Response Relationships and Trophic State Indices,” Report to US EPA, EPA 600/3-78-008, US EPA, Corvallis, OR (1978). Rast, W., Jones, R. A., and Lee, G. F., “Predictive Capability of US OECD Phosphorus Loading-Eutrophication Response Models,” Journ. Water Pollut. Control Fed. 55:9901003 (1983). http://www.members.aol.com/annelhome/PredictiveCapabilityOECD.pdf Richards, F. A., “Anoxic Basins and Fjords,” IN: Chemical Oceanography, Vol I, Riley and Skirrow (eds. ), Academic Press, London (1965). Sonzogni, W. C., Larsen, D. P., Malueg, K. W., and Schuldt, M. D., “Use of Large Submerged Chambers to Measure Sediment-Water Interactions,” Water Res. 11:(5)421464 (1977). Stumm, W., and Lee, G. F., "Oxygenation of Ferrous Iron," Ind. Eng. Chem. 53:143-146 (1961). 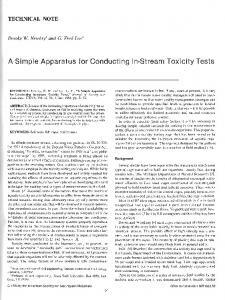 http://www.members.aol.com/annejlee/StummOxygenFerrous.pdf Stumm, W., and Morgan, J. J., Aquatic Chemistry, Chemical Equilibria and Rates in Natural Waters, 3rd Ed, Wiley-Interscience, New York (1996). Thibodeaux, T. J., "Recent Advances in Our Understanding of Sediment-to-Water Contaminant Fluxes: The Soluble Release Fraction,” Aquatic Ecosystem Health and Management 8(1):1-9 (2005). 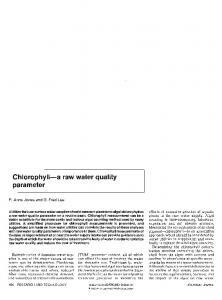 http://www.che.lsu.edu/faculty/thibodeaux/AEHMS.KEYNOTE.CHICAGO.02.ppt Vollenweider, R. A., “Scientific Fundamentals of the Eutrophication of Lakes and Flowing Waters with Particular Reference to Nitrogen and Phosphorus as Factors in Eutrophication,” Technical Report DAS/CSI/68.27, Organization for Economic Cooperation and Development, Paris, 250pp (1968). Vollenweider, R. A., “Advances in Defining Critical Loading Levels for Phosphorus in Lake Eutrophication,” Mem. 1st. Ital. Idrobio. 33:53-83 (1976). 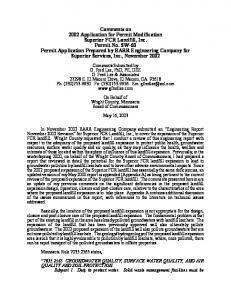 Report "Sediment Oxygen Demand1 - G. Fred Lee & Associates"